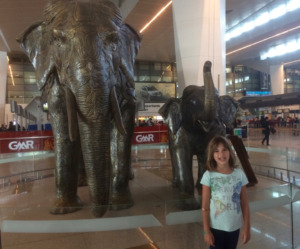 Going to the airport with kids can be a frustrating experience for parents. Now imagine what it’s like for a child. Their routine is disrupted, they are being asked to stand still when their body wants to move around, they might be tired, hungry or bored and can do little about it. The potential for meltdowns is high. The best thing we can do as the responsible adults in their lives, is to have empathy, to prepare your child for what to expect, and to prepare yourself to handle the challenges that will inevitable come up. Here are some tips and strategies to help you do just that. Adjust as necessary to fit the age of your child. Check-in the night before to help minimize the time you need to wait in line. Arrive at the airport with time to spare, as shorter legs walk at a different pace than longer legs. 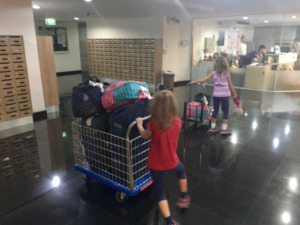 Allow your child to push the baggage cart (or help push it if it’s heavy). If you need to use a check-in kiosk, let your child help put the information in. When waiting in line, play mental and verbal games such as ‘I Spy’, ‘We’re Going on a Picnic’ or make up your own. If you’re child is antsy, have them do jumping jacks, run on the spot, or the chicken dance. Have some snacks handy in case your child gets hungry while waiting in line. Consider bringing small fidget toys like a rubiks cube or silly putty to keep their hands and mind busy. Bring magazines for your child to look at. We liked High 5 and Highlights, though there are many other great ones to choose from. I put a post on a neighborhood message board asking for kids magazine that weren’t needed anymore. I ended up with a boxful – all free! Have your child push the elevator button and thank him/her for being so helpful. If you have more than one child and they start to fight over who gets to do what, see if they can both do it. If not, have them take turns. For example, can each one push a baggage cart? For elevator buttons, my girls resolved the issue by having one push the up/down button on the outside and the other one pushed the floor/level button on the inside. Bonus tip: If your child goes by a nickname, make sure the tickets are booked in his/her legal name, and that it matches the name on his/her passport. 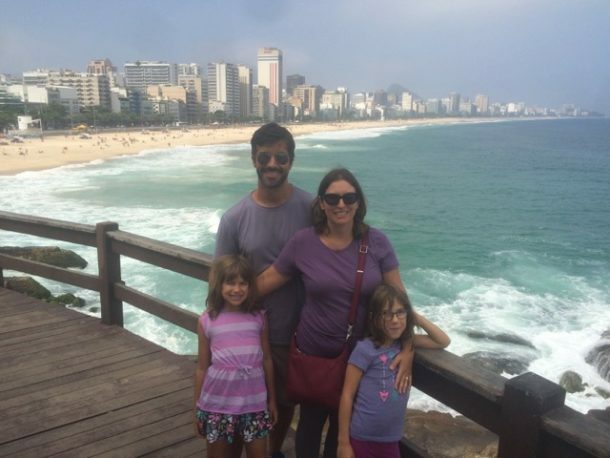 We saw a family of 5 get held up at the check-in desk for this very reason. The security line can be a challenge depending on whether it’s at a standstill or is moving steadily. Prepare your child for what s/he will have to do. For example, will they need to take off their shoes and coat? Explain that your child will have to wait for the security personnel to give the okay before going through the metal detector. If you still have water in the line, ask your child if they can be a big help by dumping the water out for you (there’s usually a container for this along the security line). As with the check-in line, play mental and verbal games with your child. You can also tell jokes or play hand games like rock, paper, scissors. Make up stories about where you think the other people in line are traveling to and what they will do once they get there. When you get to the front of the line, let your child get a bin for you. If your child is the really helpful kind, let your child put some of your things in the bin for you. Then on the other side of the detector, let your child take things out of the bin. Thank your child for being helpful. Make it a race to see who can get their shoes back on and get all of their belongings first. lead you to the gate. Let your child run to an agreed upon spot, as long as they are mindful of other people. 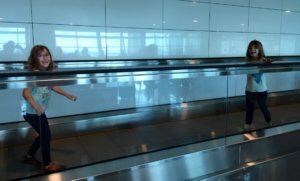 For example, my girls can run to the end of the moving sidewalk, but have to wait for us before they go on the next one. Our rule is they always have to be within eyesight. 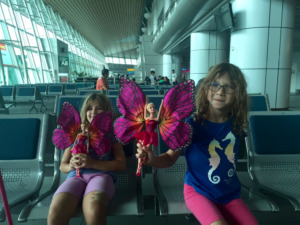 Depending on your time constraints, allow you child time to look at the stores, and to pick out a treat as a Thank you for being patient in the airport. For us, that meant the girls got to have a donut, something they don’t usually get at home. If your child is tired, allow them just to rest on you. Play a family card game. 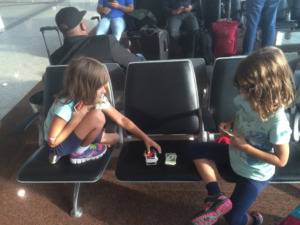 We played many games of Uno while waiting at airport gates. 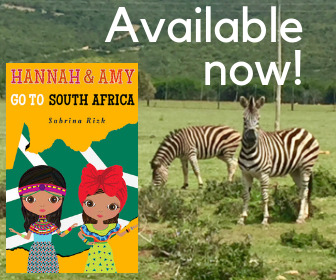 Have your child read a book or read to them. 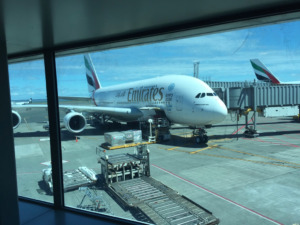 If it is not dark, watch the airplanes takeoff and land, or just look at all the different designs on the airplane tails and talk about the countries/continents those airplanes are from. Allow your child to hang from bars, or run in a small area, if it is safe to do so. When lining up to board the plane, allow your child to hold their ticket, if it is a paper one. If your child is getting overwhelmed, have him/her take deep breaths, stretch, listen to relaxing music, or close their eyes to cut out visual stimulation. Point out the signs for Baggage Claim and have your child lead you to the baggage carousels. Amy liked getting their suitcase off the carousel. Let your child help you get the baggage cart and take the bags off the carousel. In the Customs & Immigration Line, try to engage your child by asking how many people they think are ahead/behind you in. line. Depending how old they are, you can make up math problems as you wait. Have your child give the Customs and Declaration card to the Customs Officer. 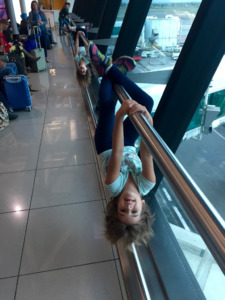 These tips and strategies will likely not eliminate meltdowns, but hopefully they will reduce the number of meltdowns and help you and your child/children have a better experience at the airport. 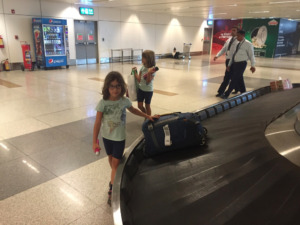 If you have tips for surviving going to the airport with kids, please leave them in the comment box below. 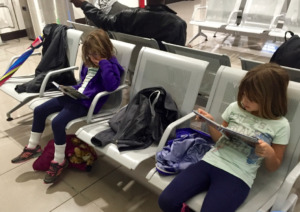 PS: Need a book for your child to read at the airport? 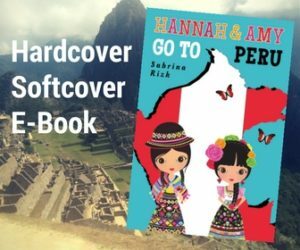 Check out Hannah and Amy Go To Peru!